My bad buddy, I searched and totally didn't see it! I'm not a big Mickelson fan. I don't have anything against him either. He just doesn't "move the needle" for me. It just seems that when it comes down to him vs another player I find myself rooting for the other guy. By all accounts a nice guy, generous tipper who takes care of the club house guys and fans. On the golfing side he is one of if not my favorites to watch and root for. I hope he achieves the career grand slam. On the personal side I really like and appreciate him as a person. He has overcome the moniker of a STAN or FIGJAM as he matured. I have had some behind the scenes looks at his foundation, He and his wife Amy are genuine and truly care about the work they do. They believe they have been blessed and it is their duty to share it with others. Every time I watch a tournament and Lefty is entered, I watch..................holding my breath for the inevitable "Oh No". Seems he has one about every 27 holes. There's been some BIG wins though too like the Scottish Open then the British Open one year. No "Oh No's" on Sunday against Stenson at last years British Open. That duel on Sunday was as good as the Tom Watson vs Jack Nicklaus duel at Carnoustie years ago. I'm always waiting for something sideways with Phil. Imagine if he averaged 11 fairways in his career, or throttling back his aggression on most occasions. Yes he has a GREAT short game, but jeez........he gets tons of practice with his misses around the greens. Especially his short side misses. Of course if Phil was fairways and greens, he wouldn't be Phil either. Love the lefty, go Phil! I'm pulling for him and the grand slam. Been rooting for Phil for a long time. My wife actually likes him and she knows little about golf... "That Phil is a handsome fella!" Never been a fan but also never root against him. His Open win was electric and one of the best times I've ever had in watching championship golf. Phil has been my favorite player since watching him win the 1991 Northern Telecom Open as an amateur. Since that time, I watch as much of Phil playing as possible. There are so many playing moments of his that are forever burned into my brain & I can remember exactly where I was when they happened. I've also had the chance to meet him & Bones briefly to get some autographs. Both super nice guys. play for some time yet. 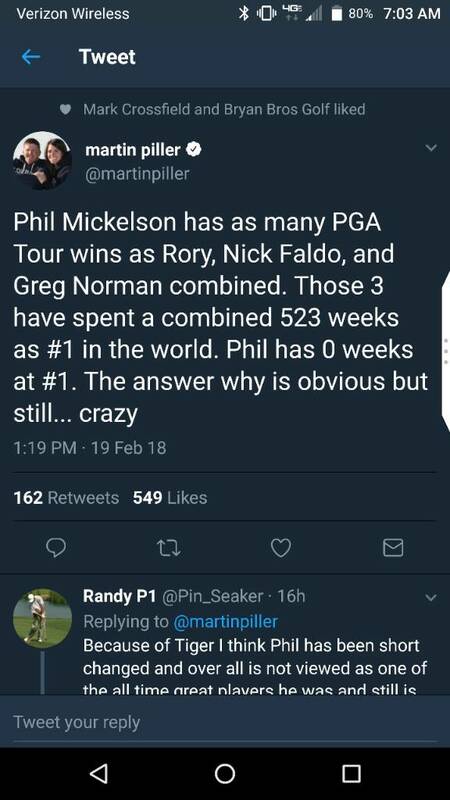 Now that Tiger is basically out of it, I think that Phil should be getting the attention. He is one of the greats of all time, but totally had been overshadowed in the Woods era. He deserves a lot more press than he gets! Phil puts on a great show for the fans and the TV networks, and his record speaks for itself with 42 Tour wins and 5 majors. His style of play drives me crazy sometimes, almost like that little brother that you were always worried over while handing him the keys to your car. That's a big part of the fun in watching Phil play. That's funny. One of my playing partners, after he puts himself in jail, will pretend he is Bones having a conversation with Phil. Yeah Phil, there is a 1 inch opening 15 yards left of that massive redwood tree, if you play a trap draw I think you have this shot. Thanks Bones, I think so too.